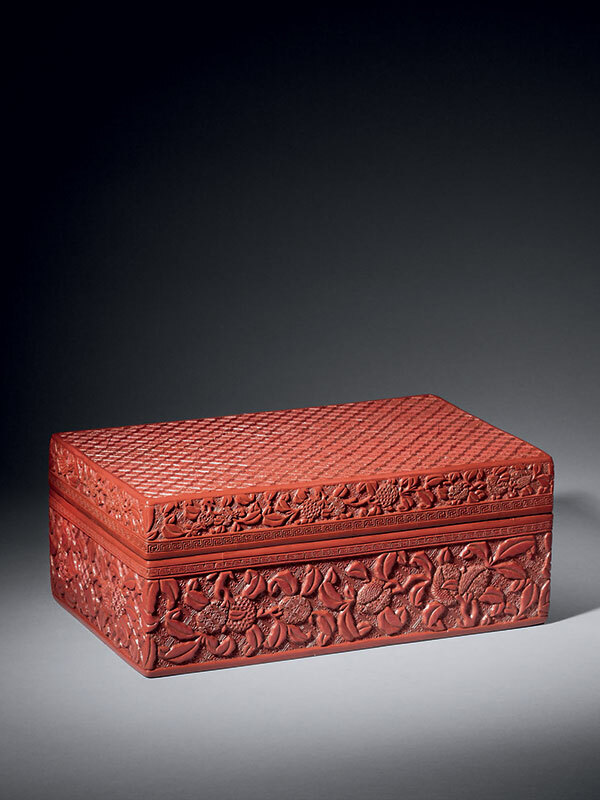 A red lacquer box of rectangular form and with a flat base. The flat top is decorated with a densely carved design of starburst diaper on a diamond-shaped ground. The straight sides are adorned with lychee fruits among branches and curled leaves. The lychee fruits are detailed with different designs including starburst and wan diapers. The rims of the cover and the box are lipped and framed by a band of key-fret pattern. The interior and the base are lacquered in black. A rectangular paper label, originally attached to the base of the box, bears a five-character inscription in calligraphy, reading Shang Xiu Zhu Shi Qi (‘Watching Slender Bamboo, Seventeen’). 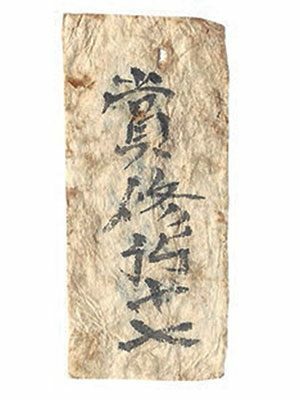 The other side of the paper label has a four-character inscription, Bao Guang Shi Si (‘Preserving Light, Fourteen’). The word for lychee, lizhi in Chinese, is homophonous with lizi, meaning ‘to have a son to continue the family name.’1 As the favourite fruit of Yang Guifei, a beloved concubine of the Tang Emperor Xuanzhong, who ordered a daily delivery of fresh lychees to Yang Guigei, the lychee is also a symbol of love and romance. 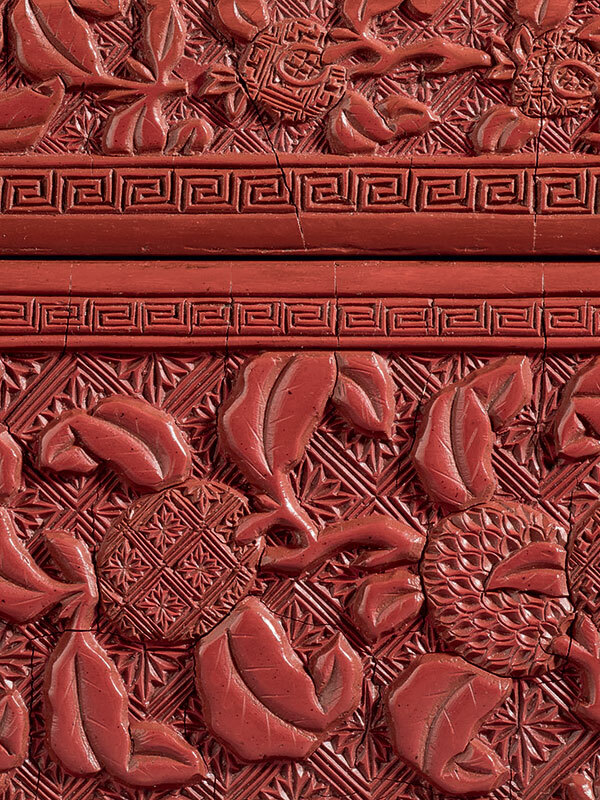 A closely comparable rectangular lacquer box similarly carved with lychee decoration and with key-fret borders, dated to the mid-Ming dynasty, is in the collection of the Palace Museum, Beijing (fig. 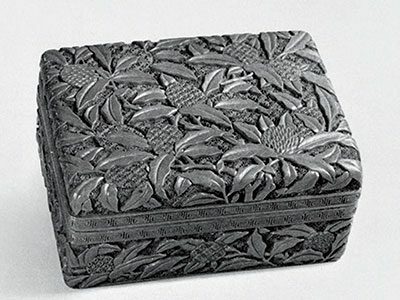 1).3 A rectangular lacquer box of similar size and proportions, adorned with a pair of birds among peony flowers on a comparable starburst diaper, is dated to the Ming dynasty, 16th century and in the collection of the National Palace Museum, Taipei. According to the label Shang Xiu Zhu Shi Qi (‘Watching Slender Bamboo, Seventeen’), this lacquer box may have once been used in the Qing Court. Shang Siu Zhu (‘Watching Slender Bamboo’) was one of the studios located inside the Shu Qing Yuan (‘Court of Purity’), a royal garden-palace complex just next to the Forbidden City along Lake Taiye, which was built during the reign of the Qianlong emperor (1736 – 1795). According to the Qing historical record Guochao Gongshi Xubian (‘A Supplemental History of the Palace during the Qing dynasty’), the Kangxi Emperor (1661 -1722) wrote this poetic name ‘Shang Xiu Zhu’ on a horizontal board, which became the title of the studio and the board was hung above the entrance of the studio. The two characters Shi Qi (‘seventeen’) following the studio’s name possibly indicate that this box was catalogued as number seventeen in the studio’s antiquity collection. It is well known that Emperor Qianlong was both a collector and a curator, who displayed his collections in a domestic setting in which he could regularly examine, touch and write about them. 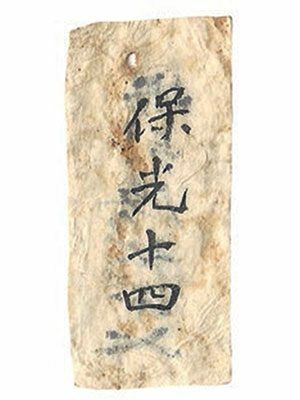 The other side of the label is inscribed Bao Guang Shi Si (‘Preserving Light, Fourteen’), which might refer to another studio inside the royal garden Shu Qing Yuan. One label with both sides written with a studio name has rarely been found or studied by scholars. This unusual practice may suggest that this lacquer box might have been originally located in the studio of Bao Guang, and was later moved to the studio of Shang Xiu Zu.